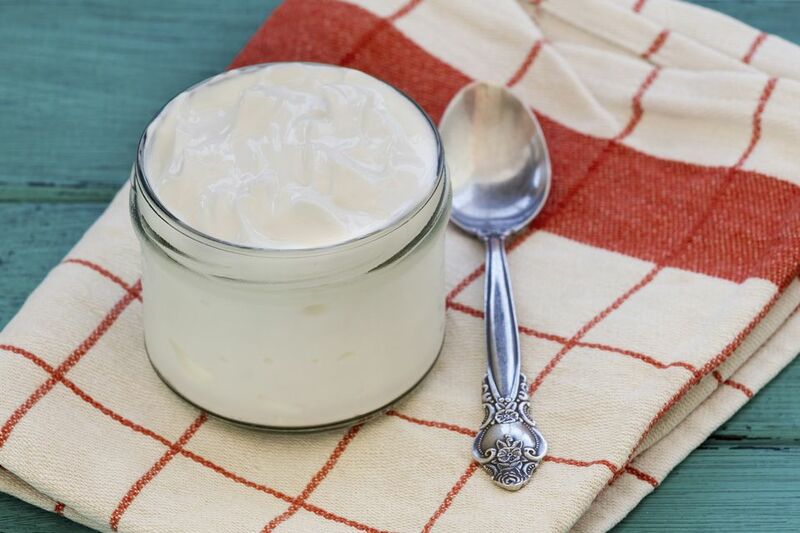 The thick strained yogurt used in Greek cooking may not be available in your local market, but you can learn how to make the homemade version. It's not only great for preparing Greek foods but other foods as well! Use commercial or homemade full-fat, low-fat, or fat-free yogurt to make the Mediterranean variety, also known as "yogurt cheese." It's easy to make this kind of yogurt, but it can take hours to complete the process, so carve out some time in your schedule to ensure you do it correctly. You'll also need string and a strainer or a colander for the straining process. Some people like to use a coffee filter to strain the yogurt. To begin, line a medium-large bowl with a piece of cheesecloth or a clean white dish towel. Then, dump a container of yogurt into the center of the cloth. Bring the four corners of the cloth together and lift the yogurt. Over the bowl or sink, twist the corners to squeeze out the liquid (it will drain through the cloth). Continue squeezing, putting the yogurt under pressure, to force the liquid out. When the majority of the surface liquid has been drained, it will start to drip more slowly. Tie off the top of the cloth just above the mass of yogurt with the string. Place the cloth containing the yogurt in a strainer or colander, and sit the strainer or colander in a bowl where it doesn't touch the bottom (so that the liquid can continue to drain). Place the bowl containing the strainer or colander in the refrigerator and allow to drain for two to three hours. After draining, take the cloth containing the yogurt and put it in the sink, but do not remove the string. Place the palms of your hands on the bag and press down to force out any remaining liquid. Remove the string, open the cloth, and using a spatula, put the yogurt in a bowl for use. If you're not sure how thick the yogurt should be, consider the consistency of sour cream. The yogurt should be at least as thick as that. Straining will reduce the volume of yogurt by half, perhaps more, so plan accordingly. One quart of low-fat yogurt (4 cups) will yield 2 cups or slightly less of strained yogurt. Using fat-free yogurt will reduce the quantity a little more, and it will not be quite as thick as using full-fat or low-fat yogurt, but it is a reasonable option for low-fat diets. How Do You Make Gravy Using a Roux?